Vagaries of The Weather © was started initially to share views and facts on the weather. It was created with passion and I was always keen to keep weather enthusiasts abreast with the latest, and share my experiences with them. 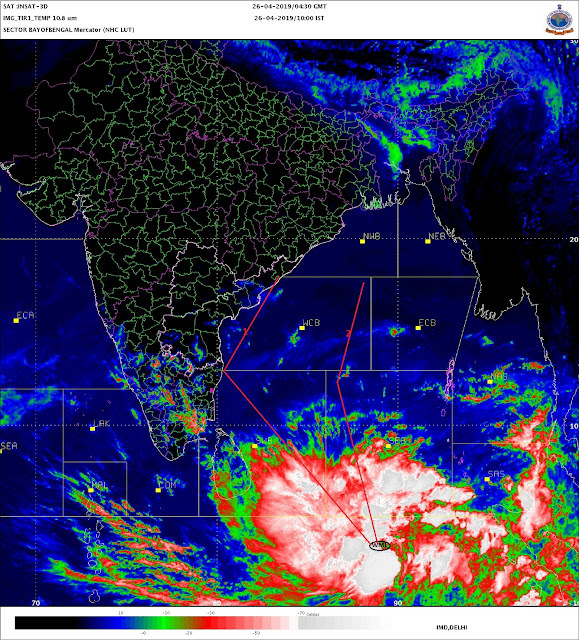 Used my limited knowledge by posting the latest on the SWM progress thru the "Monsoon Watch" series, and chased depressions and systems trying to figure out their erractic behaviour. Caught myself running up the wrong "track" at times. By trying to place the jig-saw pieces in place, I try to work out the regional forecast..and many a times find myself sailing "upstream". As one ardent reader gave a comment sometime ago.."Rajesh, you are sticking your neck out again ". Whether its the hottest day, or the coldest night, or the wettest place..any news weather wise... is attempted to be shared on Vagaries. Initially my scope was limited to the Indian weather scene, but, recently, I have taken the liberty to extend and cover the neighbouring countries and some parts of the Middle East region. Always am keen to learn more about the weather in the sub-continent. Hope readers in the neighbouring countries enjoy this blog and find it useful, and send feedback and their views. Vagaries has a numbering method for W.Ds and other systems from the seas.This has made blog reading much easier and less complicated when 2 or 3 systems appera simultaniously. W.D. numbering was started 2 seasons ago, and are named month wise, that N-2 for the second W.D. in November. Vagaries commenced covering European and U.S. weather events by partnering with Mark thru his blog. With many regular readers of Vagaries interacting and with their inputs, our blog has become more responsive. Ok, someone wants to remain anonymous, its their decision. Its appreciated that by adding a little humour, readers do not want to demean the seriousness of Vagaries. I have maitained vagaries in all earnestness, and am thankful to have sincere readers who consider reading this blog as part of their daily routine. An occasional bout of light reading and humour is always welcome. Laughter is the best medicine, as "you dont stop laughing because you grow old, you grow old because you stop laughing" ! Getting the blog more technical is not going to help many a reader. In fact, if one goes thru the previous comments, Vagaries had received requests to make it simpler to understand. As our regular reader Pavan says, readers come from a variety of fields, and want the blog simple and comprehensive. Sir i thnk u felt with the cmt of anos2, these are unpredctble local distrbnces causd due to heat up hope u vagaries continues with al doldrums fr ages to come, and it s immaterial whether "KARTHIK READS IT OR NOT"
@rajesh,,,, frustrating to see santacruz at 36.7 c yesterday!!!! Is it due to N-2 effect?? ?wen will the maximum go down below 34.??? Bbc forecasts have already predicted 38 C!! Great blog. Highly informative. Generalized, layman type reporting for all the enthusiasts. and it takes a great deal of dedication to update it daily with facts and figures. of course, you will not be 100% correct all the time, even the supercomputers with all the numerical predictors are not 100% correct. but in general, your blogs are informative and accurate enough for me. of course, your mumbai forecasts and predictions are much more accurate because you are aware of the local conditions there, still, your overall predictions are quite good. On the topic of temperatures, here in Kathmandu, Nepal, we are in the early stages of winter with temperatures in the range of Low:8 to High: 25 range. From 10 A.M to 3 P.M the temperature is above 20, rest of the time its below 20. Its pleasant here now. And we don't expect any rain in the month of November, so any rain now will be a bonus. Keep going with your blog, I still have a lot to learn. Keep up the good work. Thank you for the excellent write up, i have been reading your blog since last 3 years. The balanced way you present the capricious weather is praiseworthy. we amateur weather followers have learnt, unlearnt and relearnt nuances of weather by reading your blog. Keep blogging. Thanks a load to all you guys,for the encouragement and support.And for your regular readership, which actually keeps me going ! Pavan:Thanks. But, anon2 only meant to keep the blog in good humour, and i dont think a little deviation should be taken in the wrong sense. I have not mentioned AS-3 in the blog, as it has fizzled out. Though all international models and IMD estimated a SW track first into the Gulf of Aden. One model had estimated a track towards the Horn of Africa. It eventually did take the track forecasted by Vagaries:Initially N, then NW and finally North, and fizzle out.